Why car seats, snowsuits, bulky jackets and bunting bags DON’T MIX! To me, this scene highlights our almost compulsive tendency as parents to be sure our babies are safe and warm. I love that scene and I thought of it last winter when we bought my daughter a nice thick snowsuit for our winter walks with the stroller. She couldn’t move much in it, but it sure kept her warm! My daughter doesn’t wear snowsuits or bulky jackets in her car seat. Lately I feel like I must be a terrible mother when I strap her into her car seat at daycare without her jacket on while all the other kids are strapped in with their bulky jackets. I want to keep my daughter safe and warm too, but did you know bulky jackets/snowsuits, and bunting bags (these look little sleeping bags made to go in a car seat) are not recommended for use in car seats by car seat manufacturers and safety experts? The car seat’s straps or safety harness are designed specifically to be positioned over your little one’s strongest body areas and need to be tight in order to keep the straps in the right place during a collision. If you are involved in a crash or even stop suddenly, any padding behind your baby (ie. bunting bag) will compress. Bulky jackets and snowsuits on babies or toddlers will also compress. The harness straps will be loose at the very moment you need them to be the tightest. What this means is your child could be partially or fully ejected from their car seat and that is bad news! Check out this link from Consumer Reports to help you figure out if the jacket or snowsuit you are using is safe in the car seat. To see what I mean, check out these two photos below. 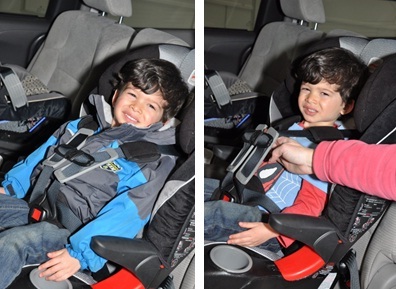 In the photo on the left, a child is strapped into his car seat with his jacket on, and the straps are pulled tight. In the photo on the right, the jacket was removed and the child was put back into the seat. The straps were left alone. Look at the amount of slack in the straps the jacket caused! Thick jackets are one of the many reasons why over 4 out of 5 car seats inspected in Halton over the past year failed a random safety check! But it’s freezing during the winter! How do I keep my kids warm?? First of all, let’s think about where your baby is spending her time while in that infant seat. The infant seat is usually kept in your warm house, makes a short trip outside into a car that will soon be nice and warm. Maybe you will be doing some shopping, so you decide to keep your baby in her car seat and use the stroller in the warm store. Your baby is now HOT! And probably fussy too. Option 1: Dress your baby in normal clothes. Add a hat, mittens and booties. Then strap him in the car seat and put blankets over top. You can remove the blankets as needed if the car starts to get really warm. Option 2: Exactly like option 1 but instead of using blankets you can purchase a warm cover designed to go OVER the outside of the infant seat. Option 3: Instead of a bulky snowsuit, use a thin snowsuit. A thin fleece snowsuit or sleeper works well, and you can add blankets as needed once your baby is strapped in. Option 1: Instead of a bulky jacket, use a thin, well-fitted jacket. If you have a jacket that has a thin fleece inner layer and a detachable outer layer, remove the outer layer before putting him in the car. Option 2: Bring your child to the car with her winter jacket on. Take the jacket off, put her in the car seat and tighten the straps. Then put the jacket on backwards so that her arms are in the sleeves and the back of the jacket acts as a blanket. Your child might get a little cold for the minute it takes to get her strapped in, but soon enough she will be nice and toasty with her jacket on backwards and your car heater on. Bonus: if she gets too hot in your warm car, she can always take her jacket off. No one ever plans to be in a car crash… but it happens every day. So, this winter, let’s campaign to keep our kids safe in the car: don’t use bulky jackets, bulky snowsuits or bunting bags in car seats. Help us spread the word by sharing this post! This entry was posted in Babies, Keeping Your Baby Safe, Keeping Your Toddler & Preschooler Safe, Parenting, Parenting Your Baby, Parenting Your Toddler & Preschooler, Toddlers & Preschoolers and tagged baby, bulky jacket, bunting bag, car seat, car seat safety, infant, Keeping Your Baby Safe, Physical Health, snowsuit, warm in car seat, winter, winter jacket. Bookmark the permalink. 5 Responses to Why car seats, snowsuits, bulky jackets and bunting bags DON’T MIX! What about a single, young mother with newborn twins. She has no car and she needs to take them out in a twin stroller. In that case would a bunting be OK? As an aside – she has almost no supports. This new mother lives with her own father, but he’s usually away. They have no car and she doesn’t drive. p.s. This mother is a friend of my friend. BTW – I’m a retired PHN. Thanks for your comment. Bunting bags are acceptable for use in a stroller, as long as the mom is aware they are not to be used in a car seat for car rides. Bunting bags can be costly – dressing the babies in warm clothes, and then strapping them into the stroller with blankets on top works well too. No, she doesn’t live in Halton. But I’m sending her a couple of practical gifts this Friday and I’ll enclose a gentle and warm note wishing her well and telling her that I’d been a PHN. I’m hoping that in so doing that I can subtly nudge her to call her own health dept! You ladies have a super blog! So proud of you nurses. Helen.